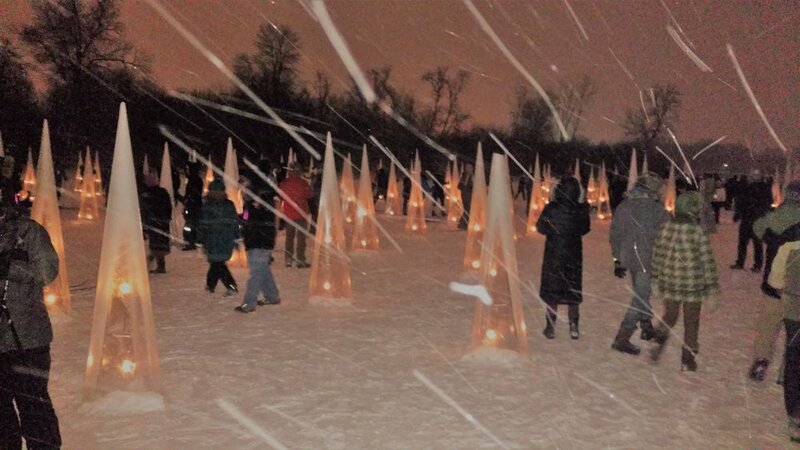 Different sizes and shapes of candlelit ice sculptures and lanterns illuminated a magical winter race on frozen Lake of the Isles, one in Minneapolis’ chain of lakes. The video showed cross-country skiers gliding past glowing pillars of ice in the purple dusk. The beauty washed over me. As the event neared, though, I checked the weather. The forecast said the temperature would hang around fourteen degrees on February 3, the day of the race, and the wind chill would be dangerous. Frostbite could occur in minutes. Would my Canada Goose jacket cut it? I’d wear snow pants too, of course, and all the extras, but would I survive this supposed-to-be-fun time with my family? Two days out, we scrambled to order ourselves face masks and ski goggles. Husband picked up a box of hand warmers. We lined up our five pairs of snowshoes. When the evening of the event arrived, we donned many layers of clothing for our romantic date with Mother Nature. At Lake of the Isles, we stepped into the excitement of a winter festival. Vendors smiled out from tents, strung with lights, at the check-in. We met up with our friend Joe and together the six of us struggled past our bulk to wrestle on snowshoes. At 7:30 p.m., our trek began. The word ‘race’ is a strange word for our wintry wanderings with hundreds of other outdoor enthusiasts across a frozen lake. No one tried to blow past anyone else. 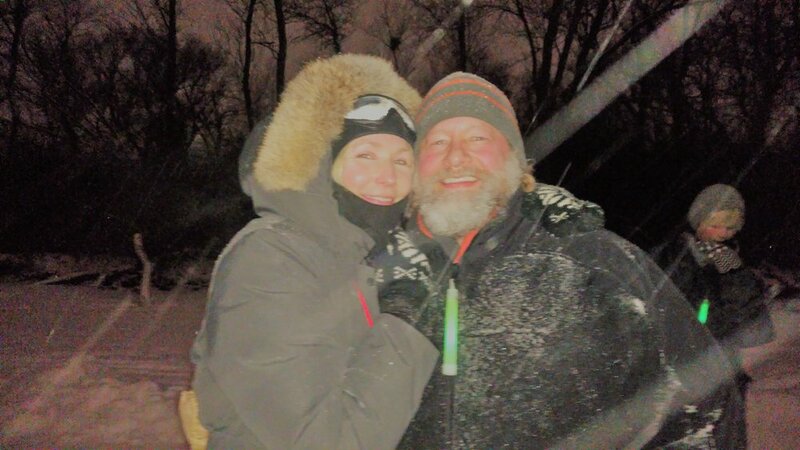 We snowshoed or skied or walked together, enjoying the luminaries. Our clothing was warm, and the winds backed off. Instead of water pit stops, this “race” had a hot chocolate stop. The sky—never completely dark in a city—whispered, What about me? And I acknowledged the loveliness of her muted orangepurplegrays. After several miles, when our legs and hips told us it was time, we headed in the direction of the car, crossing a portion of Lake Calhoun on the way. This lake wasn’t lit up like the other. I shivered at its haunting magnificence, most of its snowy expanse untouched by humans. And that night, we all won the race. Teenage girls are like puppies.